I am a firm believer in teaching phonics to produce great readers. Having a firm foundation in phonics does not negate the need for “sight words” or memorizing “frequency words”. You can give your child confidence and fluency in early reading but helping them to memorize those words. There are a variety of ways that this task can be approached and The Reading Game is a fun way to put these words to memory, build confidence and allow your child the quick feedback of reading a book. The Reading Game was created by Kenneth Hodkinson, the author of Wordly Wise vocabulary products. After watching one of his young granddaughters pretend to read, he was inspired to create a product that would help her to learn to read. After a week of using The Reading Game, his granddaughter was reading! What a wonderful testimonial for a product! So what exactly is The Reading Game and how does it work? It is beautiful in its simplicity. I love simple. I’m not a song and dance kind of gal when it comes to reading. The Reading Game consist of 6 packets of cards. Each packet of cards has 6 memory games; 10 cards making 5 matches. After the packet of cards is mastered (meaning the child can quickly read each word), a coordinating book can be read using the words from the packet of cards. The first set of 10 cards is placed face down. Taking turns with your child, you flip two cards at a time. When a match is made you read the word and have the child repeat. Once the child knows the words, he can read the word when the match is made. Every two games, test sentences are given so you can access whether your child is fluent in the reading of those words. Once all 6 memory games are mastered, it is time to grab the book and read! This process continues until all six packets of cards and books have been mastered. Simple! And effective! 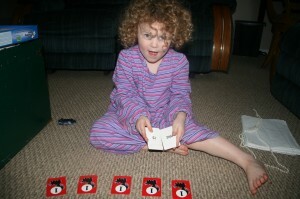 I used The Reading Game with my 5 year old daughter who was already in the midst of her phonics lessons. However, I felt it would serve her well to give her confidence and fluency. I was right. She loves to play The Reading Game. 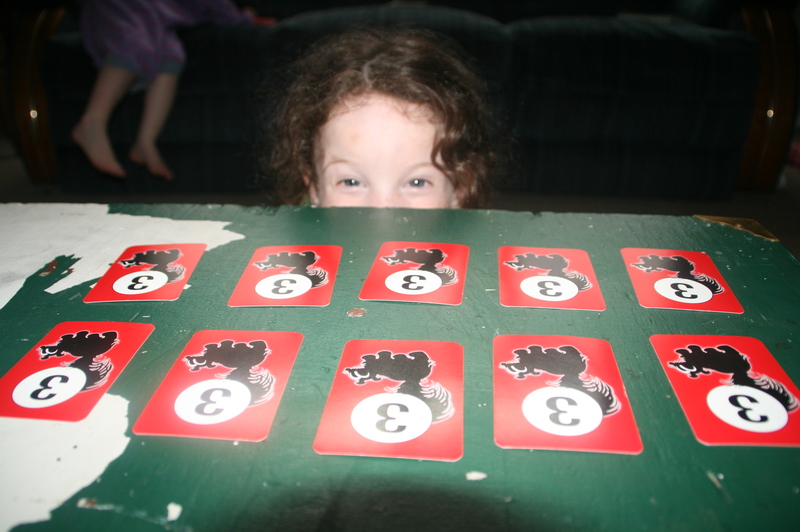 Tackling the first two memory games and knowing most of the words already delighted her. When she encountered new words in later games, she picked up on them quickly. 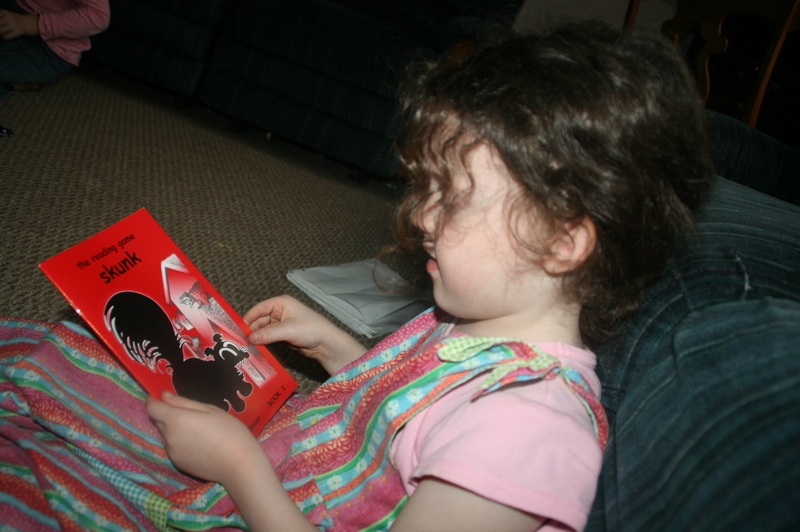 Her excitement over reading the first book was a joy to watch. It has carried over into her phonics lessons in the sense that she has greater confidence in her ability to read and doesn’t doubt herself as much. I’m sure it doesn’t hurt that she plays a mean game of memory and well, I’m not so good at it. She enjoyed beating mom at her reading game. I did try The Reading Game with my 3 year old but she isn’t quite ready. She doesn’t have the focus or desire right now. But I will be pulling it out again for her when she shows signs of being ready. I also want to comment on the actual books. They are made of sturdy paper that isn’t going to easily get torn or worn from use. The illustrations are black and white. Nothing flashy to distract your reader but engaging. My daughter giggled her way through her first book; enjoying the pictures of a not so happy encounter between a skunk and a dog. 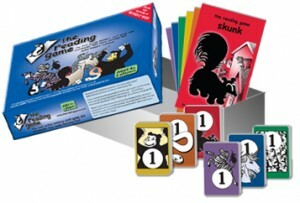 The Reading Game is a well made, simple yet effective product that can be so helpful for new readers! You can purchase The Reading Game for $24.95. That includes the six packet of cards, six books and a teacher/parent guide. As always, other Crew Members were able to review this product as well. Take a moment and see what others are saying about The Reading Game! *Disclaimer: As a member of TOS Review Crew, I received a complimentary copy of this product for review. No compensation was made. The thoughts/opinions expressed in this post are my own. This entry was posted in Homeschool, Preschool, TOS Crew Reviews by sweetie. Bookmark the permalink.